Primary muscular hydatidosis is a very rare condition with an incidence of 1%–4% in endemic regions. 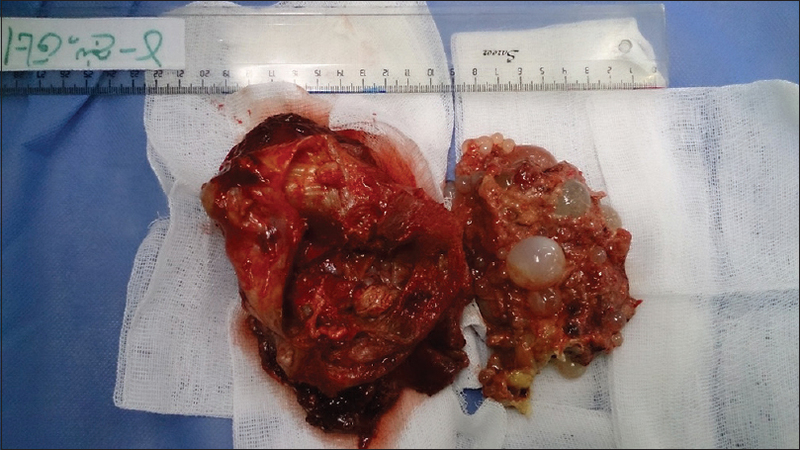 This case report describes an unusual location of hydatid cyst in the sartorius muscle and the application of imaging in its preoperative diagnosis, choosing a treatment strategy, and monitoring. Hydatid disease is caused by Echinococcus granulosus. A hydatid cyst can essentially affect any tissue or organ; however, the most commonly affected organs are the liver and lungs. Primary muscular hydatid cysts encompass <0.7%–3% of these cases proving to be particularly rare. A 59-year-old female presented to the hospital complaining of a slow-growing painful mass in her left thigh. On examination, a firm, tender, fixed mass of 6 cm × 11 cm was noted on the anteromedial aspect of the proximal left thigh. There was no fluctuation, erythema, ecchymosis, increased temperature, or lymphadenopathy on palpation. Blood tests were unremarkable. The second line of investigation was magnetic resonance imaging (MRI) and revealed an oval-shaped multiloculated well-defined cystic lesion in the medial compartment of the sartorius muscle, containing smaller round-shaped cysts, hypointense in T2-weighted, and mostly favorable of daughter cyst [Figure 1]. There was no sign of bone destruction or peripheral edema on the images. The cyst was excised surgically en bloc, 20 cm × 13 cm in dimensions, and the cut section showed multiple daughter cysts [Figure 2]. The diagnosis of hydatid disease was confirmed by histopathological examination of the specimen which revealed scolices, daughter cysts, and fragments of the lamellar membrane [Figure 3]. Primary muscular hydatid cysts are particularly rare, but the commonly affected muscles are peripheral such as supraspinatus, biceps brachii, gracilis, and quadriceps. There have only been a few primary hydatid cysts in the sartorius muscle reported in the literature. Due to the rare nature of soft-tissue hydatid cysts, its diagnosis relies on strong clinical suspicion. A preoperative radiological work-up is significantly beneficial as it may reveal the characteristic features of a hydatid cyst. A constant low-intensity rim with a maximum thickness of 4–5 mm, multicystic appearance, a homogeneous signal intensity of the cystic fluid, and the presence of daughter cysts are the most characteristic MRI features of hydatid disease. MRI is capable of sufficiently demonstrating these characteristic features and may be applied in monitoring the response to treatment. Given that hydatid disease generally localizes to hepatic and pulmonary regions, the patient with echinococcosis should be thoroughly examined and investigated in a systemic manner., Systemic evaluation of our patient did not reveal any additional lesion. Surgical resection in conjunction with medical therapy is the preferred management for isolated echinococcosis. Rupture or spillage of the cystic fluid must be avoided to prevent local or distant dissemination of daughter cysts and immediate anaphylactic reaction. Argy N, Abou Bacar A, Boeri C, Lohmann C, Pfaff AW, Hansmann Y, et al. 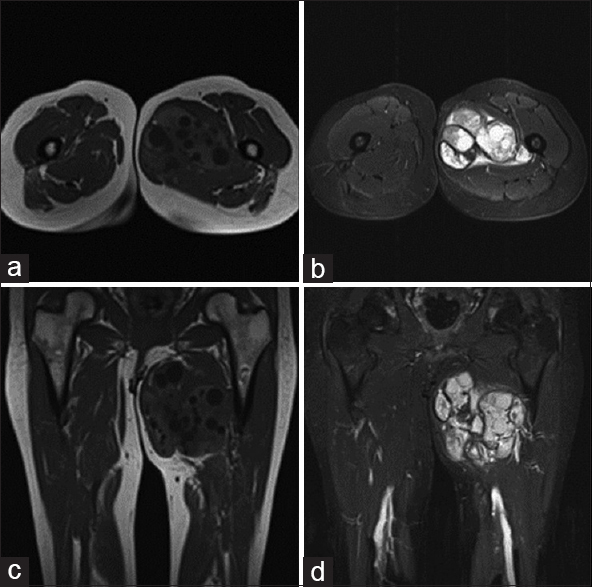 Primary musculoskeletal hydatid cyst of the thigh: Diagnostic and curative challenge for an unusual localization. Can J Infect Dis Med Microbiol 2013;24:e99-101. Keskin D, Ezirmik N, Karsan O, Gürsan N. Primary hydatidosis of the gracilis muscle in a girl. J Int Med Res 2002;30:449-51. Karakas E, Çullu N, Altay N, Ozturk IA. Infected primary hydatid cyst located in the sartorius muscle. Indian J Med Microbiol 2013;31:412-4. Duygulu F, Karaoglu S, Erdogan N, Yildiz O. Primary hydatid cyst of the thigh: A case report of an unusual localization. Turk J Pediatr 2006;48:256-9. Polat P, Kantarci M, Alper F, Suma S, Koruyucu MB, Okur A. Hydatid disease from head to toe. Radiographics 2003;23:475-94.